Just in – RhinoTech is offering 20% discount on SingleStep heat trasfer paper! From 9/9-14/2013, receive 20% off of your order w/on-line purchase using Code: SS913. Order at rhinotechinc.com. 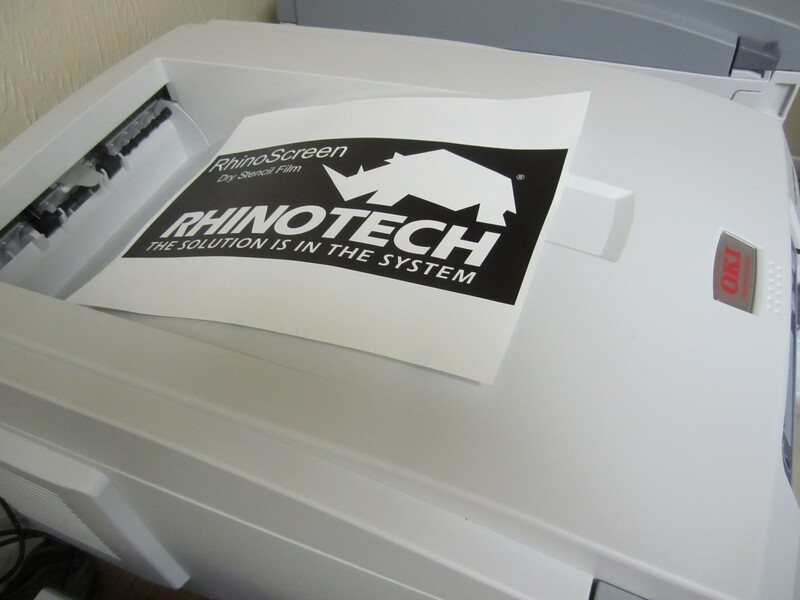 RhinoTech relates that its weedless, SingleStep™ heat transfer laser paper prints on white and light color t-shirts, hats and other fabrics. It’s a one step digital process that transfers the toner, not the background film. And to print on dark ts, hats and other textiles, use Textile Metallic Foil to make a design pop w/ vivid color, drama and added value! When You Want to Start a Home-Based Printing Business, Read this First. I’ve been working in a home-based environment for 19 years. And I wouldn’t have it any other way. It was a big leap from a corporate office situation, but the benefits have far and away surpassed any doubts I had (or the naysayers). Because I have day-to-day customer contact via phone and in-person, I’m not devoid of human connection and people I enjoy working with. I Skype, text, Tweet, use Faxbook, Linkedin and e-mail, so I engage all day long. If I have to rush out to handle an elderly parent issue or take 1, 2 or all 3 of them to a medical appointment, I can do that and make up the time later. My office is always open. Throughout the years, the benefits to this arrangement have surpassed any negatives. In the early years, my growing family prospered because mom/marketing director, grant writer and volunteer was always on deck. At this juncture, evolving issues surrounding elderly parents (3 in our family) are able to be attended to while I happily return to my home-based office to pick up where I left off with no glowering employees or managers to return to. No time clocks to punch. Much less stress on me. And higher work output. Before I took the leap, though, I did lots of research. The following is as thoughtful and thorough, as possible, as you consider the way to self-employment. There are some great opportunities, but you must do your research to make sure that a home-based business will be right for you and within your means. By being careful, attentive and working closely with your accountant, you can be successful, prosperous and happy in a home-based venture. I’ve related the following toward opening a home-based screen or graphics and/or heat transfer printing business (hence the references to creativity). KNOW YOURSELF. Do you enjoy manual work and the opportunity to see the immediate results of your skill and creativity? Will those lost creative juices appear again with a customer? Do you enjoy being in control of your day and your decisions? Is managing your own money an investment that will advance your family’s livelihood? KNOW YOUR SKILLS. Do you like being in charge? Are you a self-starter who doesn’t need anyone to direct you on where to begin? Can you voice your limitations to ensure your success? Can you be a manager, sales/marketing rep, handle inside/outside sales,AP/AR answer phones and print at the same time? Ask yourself: am I a patient, calm boss willing to teach or will I send any new employee (that could potentially be a family member) running due to my inability to teach and motivate? Can I gather the necessary technical support? KNOW YOUR FINANCES. A start-up averages $15,000, but can range above or below that mark. You will need to cover:1) initial equipment and materials purchases; 2) internet/all communication connections); 3) utilities; 4) consumables; 5) mileage/vehicle maintenance; 6) printing, advertising, marketing; 7) subscription costs for trade publications, exhibits at trade shows including shipping, travel, per diem, hotel); 8) time to social network, build a website, e-market); 9) personnel costs and benefits (as the company grows). You have to maximize every dollar. You have to have the ability to realize a high profit margin (based on equipment costs, etc) in conjunction with your learning curve (that will generate missteps that cost money). If you are able to handle these costs with the money you have today, then an investment in a home-based business seems feasible. KNOW YOUR FAMILY. Ask yourself, how much time can I devote to a home-based business without jeopardizing my family’s life? How much energy do I have to devote to learning new technology and starting small? Can I utilize the time/talent of my teenagers or my children’s children who are technology vibrant at their young ages to help me in this venture? How much support can I expect of my spouse or partner? Are you are secure in knowing that you have a base of support in your family, that they are aligned with our goals and future outlook and are supportive of the time that you will devote to your new business? KNOW YOUR ENVIRONMENTAL CAUSE. In the heat transfer, screen and graphics printing industry, countless businesses are “greening” their way of doing business. From installing long-lasting light bulbs, to using recyclable papers, to lessening the impact of ink on the environment, to flexible hours, all these efforts help to reduce our carbon footprints. CREATE A BUSINESS PLAN. After careful thought and research, write out your business plan. Though many business owners run on “instinct”, the overwhelming consensus is to have a Business Plan that is realistic for you. And, you don’t have to reinvent the wheel. Here is a jump-start when you click on: How to Write a Business Plan. This resource will offer you a sample plan and help. A basic Business Plan will help you allocate resources properly, handle unforeseen complications and make good business decisions. The plan will offer specific, organized information about your company and how you will repay borrowed money. You’ll need a Plan as part of a loan application if you are going to seek a small business loan. THE FINAL CONSIDERATION. If you picture yourself working at home with your kids playing at your feet, a home-based business, dare I say, might not be the best fit. Any home-based business owner, like me, will tell you that it takes immense self-direction and motivation to be successful. Distractions of daily life will not fit into this picture, so it is important that you understand what type of worker you are. So now we’re at a place where you have to ask yourself what sustains you, right now, on a daily basis as an employee or boss? Is it the social aspect of going to work with lots of people around? Does daily change unhinge you? Does it make you feel secure to know that you will generally achieve your daily goals, every day, and that most days will not be much different from the next? Do you prefer being in the second spot, following directions of a manager? Is your family content knowing that you go to work at 8 am and will be home by 6 pm? If you answer yes to one or more of these questions, you should probably re-think a home-based business venture. I answered NO to the above questions a very long time ago and remain happy with my decision. The majority of the time, my family has been happy, too. As we all know, though, life and work are not perfect. Expect ups and downs if you go forth. In the end though, I think you’ll be wildly happy. Thanks for reading and subscribing. And good luck!